Good quality RO water purification like an ark, 10years still good running. Reverse osmosis water purification is used to produce pure water. It will removed all contaminants of raw water to produce purified water, Like solids, bacteria, algae, viruses, fungi, minerals such as iron, manganese and sulphur, and man-made chemical pollutants including fertilisers. When people drinking the pure water, they will feel naturally sweet because of the pure. Because of pollution, almost all worlds river, lake, underground and spring is been pollution. RO water system become more and more popular. 1). This system adopts the most advanced Reverse Osmosis pure water filter technic. Its water production conductance rate generally less than 10us/cm, which precedes the national standard GB17323-1998 bottle pure water standard. The reverse osmosis water made by this RO system is asepsis, non-granule and pure. Prevention of membrane fouling (including Fe3, Fe2, CaCO3, CaCO4, SrSO4, CaF2, SiO2, iron, aluminum oxide). Prevention of colloidal material and suspended solid particles from plugging. Protected when no power,poor power,large electrical cuttent short circuit,creepage of electricity. In light of corrosion, pressure, vibration and temperature when choosing filter materials, we offer tailor-made solutions according to raw water conditions of our customers. For example, if the TDS of raw water is very high, customers will be recommended to use fiber glass filter tank so as to optimize the whole water treatment system and also prolong the life of the reverse osmosis water treatment equipment. It use to storage raw water, Stable Ro system raw water flow and pressure,protect the raw water pump. The raw water tank with built-in water stainless steel ball valve and liquid level controller. Brand: China South Pump. 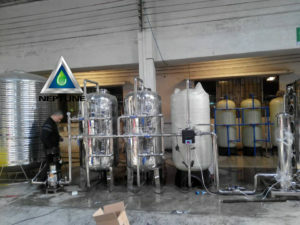 It will deliver the raw water to the system, it is control by PLC. Liquid level controller can control the booster pump’s start and stop. Prevent the particles entering the membrane, scratched the surface of the membrane. In the normal operating condition, the filter can maintained for 3 mouth. The filter structure for fast replace. It can removes the hydronium, organic substance, colloid, bacteria and other impurity by the method of membrane. And the water can be desalted and purified. The theory is as follows. The treated water and the untreated water are separated by the membrane; the treated water osmoses to the untreated water. There is osmotic pressure between the two. If the pressure is added to the untreated water and the pressure of the untreated water is bigger than the osmotic pressure, the water of the untreated water osmoses to the opposite position of the water. This applies the reverse osmosis to the desalted water. 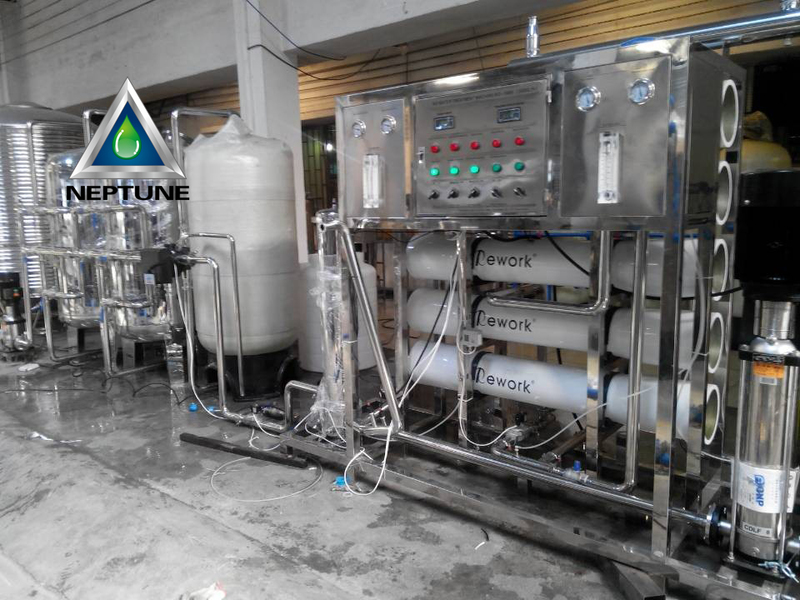 That is to say the untreated water is purified into the pure water through the RO membrane under adequate pressure. The left water which can not osmosis through the membrane contains a lot of solute and suspended substance, and it will be drained out as waste water. The water must be pretreated before entering into the RO system, or it will bring damage to the RO membrane. The RO system not only can be used for desalination, but also for filtering the organic substance and bacteria. The production of water is monitored by the liquid crystal display conductivity meter. The RO system needs be cleaned timely, including the stainless steel pump, filter, disinfectant tank, valve and other components. Commonly, the RO system should work once every day. If it does not work in one week, it must be protected by some measures, or the service life of the membrane will be serious affected.